We joined forces with Banbury Litho to co-host "Banbury's Biggest Coffee Morning", raising funds for Macmillan Cancer Support. With one in three people being diagnosed with cancer, we wanted to show our support and help Macmillan Cancer Support achieve their goal that no one faces cancer alone. 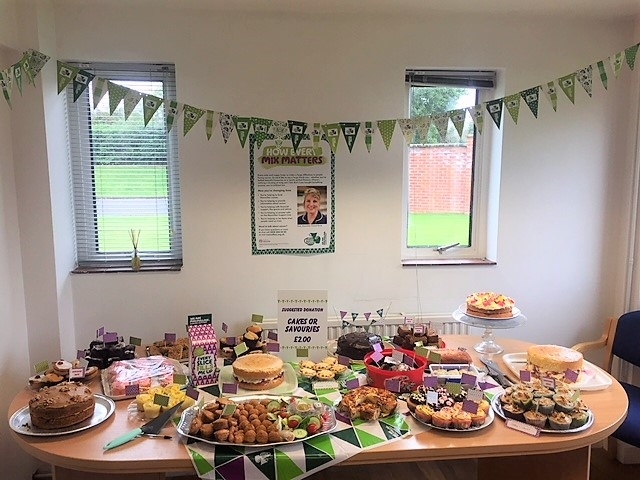 We joined forces with Banbury Litho, a commercial printing company also based on Vantage Business Park, to host a Macmillan Coffee Morning on Thursday 28th September 2017. An abundance of tasty treats and hot drinks were available for a small donation, and we were delighted to be joined by so many staff members, suppliers and customers. In addition to the food and drink on offer, there was a "Bucket of Benefits" fundraising competition where entrants could win one of a fantastic range of prizes! Winners, seen below, were randomly selected by picking their business card out of a bucket. All of the prizes were kindly donated to raise money for this amazing cause. Together with Banbury Litho, we raised £1,000 for Macmillan Cancer Support! Thank you to everyone for your amazing generosity and support! A considerable increase of last year's total of £741. A big thank you from everyone at M&N Heating & Plumbing and Banbury Litho for the amazing support and generation donations. Thanks to our sponsors too for donating a great range of prizes for the "Bucket of Benefits". Notable mentions to National Portrait Gallery, Streamline Office Services Ltd, Banbury Gunsmiths, Banbury Butchers, Bloxham Nursery and Ignition Design. To find out more about Macmillan Cancer Support, and the World's Biggest Coffee Morning, please visit: https://coffee.macmillan.org.uk.